We offer two different sessions two help our seniors get what fits them best. Fell free to bring your own props to help you express “Who you are!” (Sports equipment, musical instrument, favorite posession, pet ). This session includes 90 minutes of shooting in 2-3 locations (indoors or outdoors) and multiple clothing changes. At the conclusion of this session there will be between 30-50 finished proofs. This is our most popular (and fun) session. With this session we give you the works!! 3-5 hours of shooting at multiple locations, unlimited clothing changes (time permitting). Bring a friend and plan on having a blast. 50-75 proofs and we include hair and make up for all the girls. This session ROCKS!! A $50 deposit is due when appointment is made. The $50 will be applied to the session fee balance. 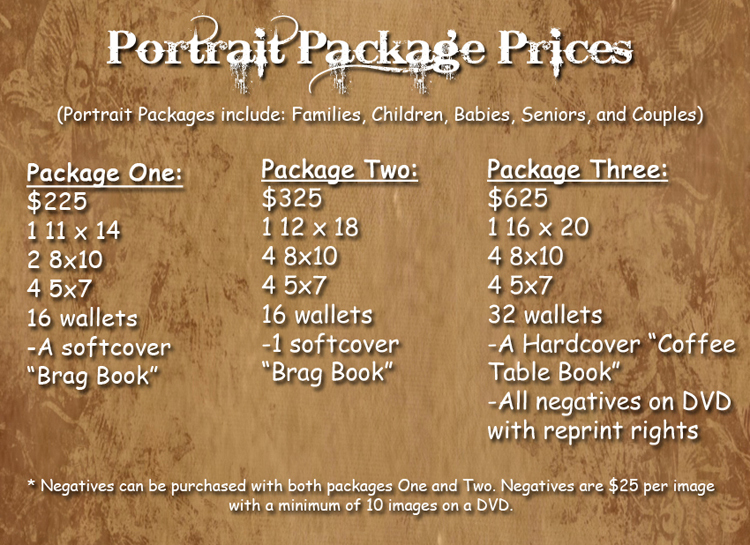 If you would like to know more about the cost of custom photography please read this article. Print payments are due before the prints are ordered from our professional printing lab. At the moment all session are on location. A park, a farm, downtown, your home. If you don’t have a place in mind just ask us and we’ll find one. The session can be anywhere within 30 miles of Anderson, IN. If the session is over 40 miles from Anderson, IN and still within Central Indiana an additional $30 travel cost will be added. Other destinations are possible simply contact us to work out the details. We offer many different options for purchasing your prints and products. We offer items ‘A la Carte and we offer a wide variety of “Package” options. We understand that there are as many different needs as there are people. Feel free to mix and match to create your own custom package that fits your unique needs. Below you will find some basic ‘A la Carte pricing along with links to pdf. documents with our latest package pricing (fall 2014).